Yes I know it is Thursday but I wasn’t feeling too good yesterday and didn’t switch on my laptop. Plus it is never to late to join in!! The lovely Dana is hosting Wednesday Photo Inspiration. Check out her blog for more info. This is a photo that is already on my blog which is one of my favourites. 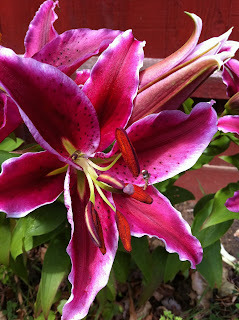 I took it in the summer and am looking forward to the lilies growing again. Wonderful! This flower is divine, I am glad you joined Dana!